my photos I took last year on vacation. One of the best examples of painting a wave I've run across. Did I mention, I really loved the DVD. You are a wonderful teacher. learn how to paint the parts of the wave using several different brushes and techniques. painting the wave parts before you start a full wave in a painting. also helpful to use while you paint along with the video. The workbook is sold separately. completed painting are included with this DVD. Previous watercolor experience is recommended for this lesson. For a limited time there is a combo set with both DVDs saving you $10 off the retail price. Save on postage when ordered with the DVD! 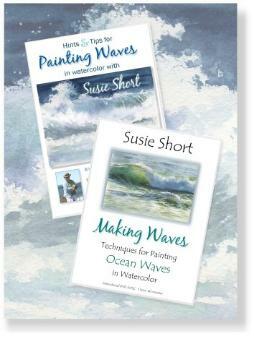 exercises and the workbook too, I am learning how to paint waves. They are not perfect, but I'm having so much fun practicing.